Glove Plus Prime is recognised as a high quality, high performance nitrile glove designed for use in areas where there is a low risk of chemical splash to the glove user. Prime offers the glove user high levels of sensitivity and comfort, low level protection against chemical splash and are ideal for use in a wide range of applications where gloves are used for short periods of time. In addition to the specific chemicals Prime gloves have been tested to as part of their EU PPE Class III certification, an independent test laboratory (SGS UK) confirms that these gloves provide excellent splash resistance compared to other gloves in our range. The tests carried out in accordance with EN374 Part 3 against a wide variety of common chemicals found in both the scientific and industrial workplace where there is a requirement of chemical splash protection for the glove user. This superior level of barrier protection extends to the barrier permeation of viruses. 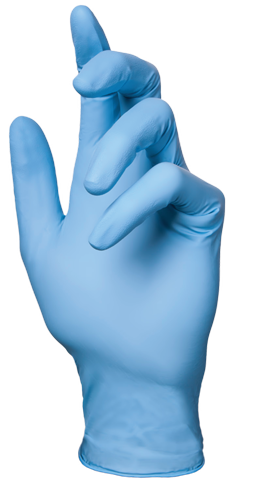 Glove Plus Prime Blue nitrile gloves have been tested to, and passed, ISO 16044b:2003 “Resistance of Materials used in Protective Clothing to Penetration by Blood-Borne Pathogens” (viral testing). Does this glove have any other benefits? Manufactured from nitrile, Prime immediately benefits from 4 times the puncture resistance of latex gloves of a similar thickness and is manufactured to a watertight AQL of 0.65 for ‘pinholes’ which ensures a lower instance of tearing and product failure. Prime is produced with a rolled (beaded) cuff which reinforced the cuff area to prevent tearing when putting the glove on and also allows for a secure fit to garments, helping prevent liquid entering the wrist area of the glove. The component glove materials in Glove Plus Prime Blue also comply with 21CFR 177. 2600 which means that these gloves are safe for use with food. Being made from nitrile, a man made material, Glove Plus Prime are 100% NR Latex free which means there is no risk of Type 1 allergies and through the use of advanced processing technology, significantly reduces the risk of Type 4 chemical allergies and is powder free to help prevent general skin irritation during use. Prime provides the level of comfort you would expect from Barber Healthcare and is manufactured using the latest, super soft nitrile formulation. It is easy to wear and, being super soft, can be worn for long periods of time without causing hand fatigue. The glove is fingertip textured for precision grip and has passed the European Dexterity test (EN420) at the maximum level 5. Available in sizes X. Small (5-6) to X. 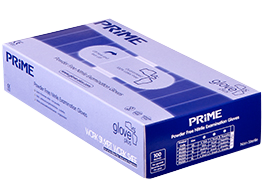 Large (9-10), Prime gloves are packed in dispensers of 100 gloves, 10 dispensers per carton sizes X.Small to Large. Size X. Large is 90 gloves per dispenser, 10 dispensers per carton.